In cancer patients, relapse rate and prognosis depend on the extent of cancer dissemination within the body. Furthermore, preoperative knowledge of tumour spread is the most important decision parameter in treatment planning. For the aforementioned reasons, it is important to understand cancer dissemination routes and the mechanisms that determine cancer spread. Tumour can spread locally or migrate to lymph nodes or travel to distant organs through the blood stream. A fourth, less known but nevertheless clinically important route of tumour spread is perineural invasion. The metastatic process is extremely selective and consists in a series of steps, all of which must be accomplished for metastases to develop. When the primary tumour grows to more than 1–2 mm of diameter, new vessels and lymphatics develop from the existing network to provide nutrients and oxygen to cancer tissue. Neovessels also allow cancer cells to escape into the blood stream. The few cancer cells that survive in the circulation and are caught in the capillaries of distant organs enter the surrounding tissue where they grow and eventually develop new blood vessels. 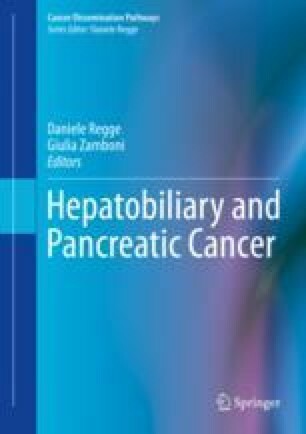 This chapter will discuss the mechanisms of local and distant tumour spread and the organ-specific nature of distant metastases, with a focus on hepatobiliary and pancreatic tumours.